There is a lot of mystery surrounding the Amsterdam-based label Kalahari Oyster Cult. Run by Belgian DJ Colin Volvert, one would be hard pressed to find much of anything written about them on the internet. The only biographical information we were able to find was the quote, “An oyster of the old school who nobody can open.” This quote is taken from Milfred Newcomb’s 1989 analysis of one of Charles Dickens’ characters Mr. Tulkinghorn. Although we do not believe Dickens’ character is meant to represent the ethos of the label, oysters and the use of mysterious quotes certainly do. In fact, in each 5 of 6 releases Kalahar Oyster Cult has come out with in their inaugural year, a quote referencing oysters can be found in the notes section each of their discogs pages. 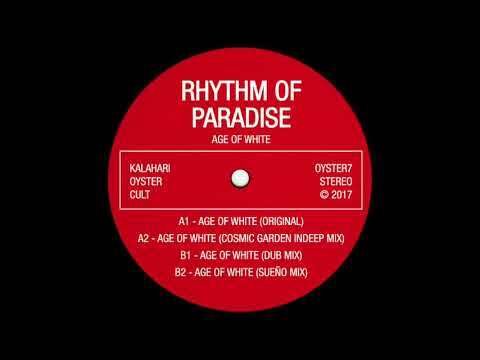 This theme will most likely continue in the label’s upcoming release of Rhythm Of Paradise’s 12’’ “Age of White.” From southern Italy, Rhythm Of Paradise’s Michele Lamacchia operates his own label Cosmic Rhythm and has been known to produce under aliases like Love Island, Mike Lee, Qubrique, and Soulvibe Inc. In his latest release, Michele has put together a proper selection of retro-fitted, extraterrestrial chunes that consist of 3 versions of the title track and a remix by his label mate Cosmic Garden. While listening to the original, one can’t help but be reminded by other producers such as Lone who have made a living off this sort of sound. By utilizing an assortment oldschool drum machines, lush Detroit synths, and majestic chimes, Rhythm Of Paradise crafts a mood that is both nostalgic but refreshingly unfamiliar; as if one were floating through intergalactic space, gazing upon unknown lands while being accompanied by a recognizable soundtrack. You know, sorta like Guardians of the Galaxy but instead of music from the 60s and 70s, Quill’s walkman is playing 90s house. For all you Star-Lords that want to take this battleship for a ride on the dancefloor, you can pre-order “Age of White” by clicking on this link right here.